As a wrap-up to the first NERCC UPP cycle, a major prize giveaway event is being planned for March of 2015. Members who participated in the Union Participation Program will be entered into drawings for a lot of VERY good prizes! "UPP Presents: Carpenters Appreciation Night" will take place with members on the second floor of the Carpenters Center and be broadcast live on the internet. More details, including information on local union viewing events and the additional prizes given away there, will be released soon. The Massachusetts Gaming commission last week unanimously voted to create a committee to monitor diversity within the construction workforce and supplier base for upcoming casino projects. The move was supported by the New England Regional Council of Carpenters and the Policy Group on Tradeswomen's Issues in which the union participates. The committee will monitor compliance with goals, including maintaining a workforce which includes at least 15.3% people of color and 6.9% women. NERCC's Elizabeth Skidmore was quoted in the Gaming Commissions announcement of the move, saying: "Bringing more women and people of color into union construction not only strengthens Massachusetts by moving more families out of poverty but also strengthens the industry by building a more diverse workforce." Allan Vitale and his company R&A Drywall, based in Goffstown, New Hampshire have been ordered to pay carpenters more than $200,000 in restitution and penalties for violations of prevailing wage laws in Massachusetts. He has also been debarred from bidding or performing public work in the state. Attorney General Martha Coakley announced the fines last week. The company violated the laws while working on Quincy College Coddington Hall and some renovation work at Haymarket Station in Boston. They were also cited for intentionally failing to turn over payroll records. The company was paying some carpenters as apprentices even though it did not have an apprentice program. It also underpaid 17 other carpenters. The case was referred to the Attorney General's office by the New England Regional Council of Carpenters and the state's Task Force on the Underground Economy as a result of jobsite visits by NERCC staff. There's welcome news for construction contractors in New England worried about a current or looming skilled labor shortage. Today, more than 900 students currently enrolled in vocational high schools or programs are visiting the New England Carpenters Training Center in Millbury, Massachusetts today. During their visit, they're learning more about the comprehensive training programs available in the diverse carpentry trade. They're also seeing some of the most sophisticated facilities in the country, combining state-of-the-art shop and work space with classrooms, dormitory, dining and recreation space. Though some students may have experience in limited aspects of the industry, today's tour gives them a comprehensive view of the trade, work conditions and career opportunities available to trained, motivated and supprted trades workers. A lack of skilled trades workers is consistently cited in surveys by employers as a limiting factor for company growth and their ability to deliver consistent quality work. Contractors signatory to the Carpenters union have the advantage of joint training programs and fairly negotiated wage and benefit packages that attract the most qualified applicants. 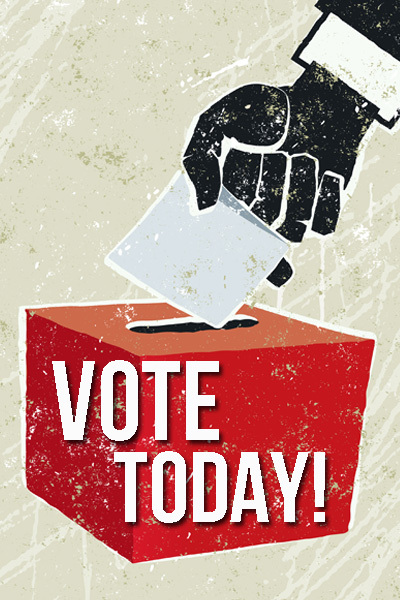 Remember to vote today, carpenters! REMEMBER TO VOTE TODAY, CARPENTERS!! NO on Questions 1 and 3 and YES on Question 4. In New Hampshire, the union has endorsed Jeanne Shaheen, Annie Kuster, Carol Shea-Porter and Maggie Hassan. years. Under Mayor Menino's leadership, Boston emerged as one of the world's great cities - a vibrant city that combines a respect for tradition and an eagerness to embrace innovation. Today's Boston is a far better place than it was a generation ago - more tolerant, more diverse, and more vital. Mayor Menino was a great friend of the Carpenters Union and the union sector of the construction industry. He understood that great cities have to grow and evolve. He was committed to development, but in a responsible manner that respected neighborhood concerns. He knew that Boston's development should benefit everyone, including the men and women that build the city's projects. He knew that it was not enough to create jobs. Boston's jobs had to be good jobs - ones that provided decent pay, health benefits, and retirement security. Under his leadership, Boston was a Union City and a great place to live, work, and play. While he was one of the world's great Mayors, he never forgot where he came from. A man of humble origins and unwavering values, Tom Menino knew that Boston's greatness was intrinsically connected with the success of those who build and work for a living. He was a friend. We will miss him. 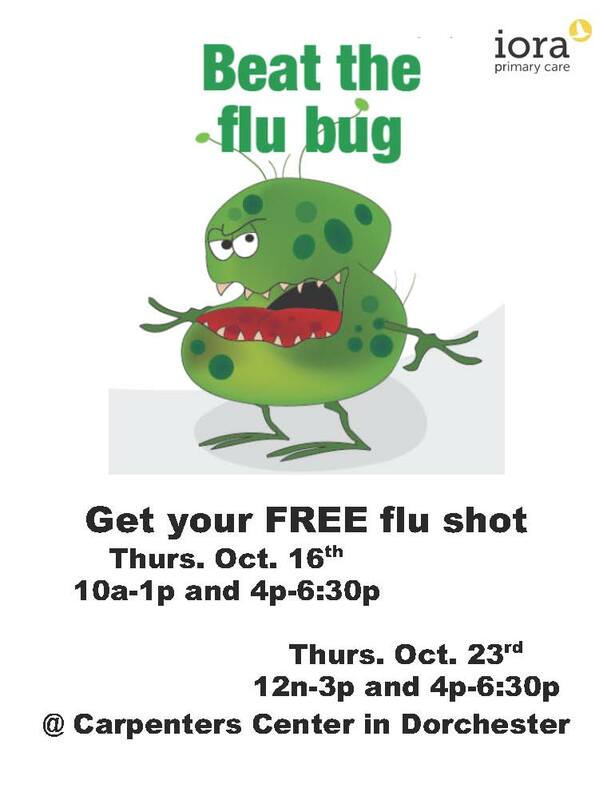 Carpenters Care is offering free flu shots at the Carpenters Center this month. Check out the schedule - no appointment necessary. 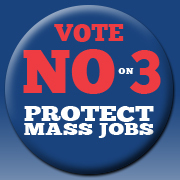 Protect Jobs in MA - Vote NO on Question 3. A NO vote will protect projects like the Plainridge Park Casino - which is moving forward despite a Nov. 4 vote on whether to repeal the 2011 casino law that made the project possible. The New England Regional Council of Carpenters and the New England Carpenters Benefits Funds are hosting a complimentary seminar “Planning for Retirement” on November 15, 2014. The seminar will be held at the New England Carpenters Training Center located at 13 Holman Road in Millbury, MA, from 8:30-12:00 pm. Registration will begin on October 14th. As of October 14th members can register online at CarpentersFund.org or by contacting the Seminar Registration Line at at 978-253-5100 to reserve a spot. If you think about a union carpenter, what image comes to mind? What if you thought of a female union carpenter? It might be time for you to imagine something new. Please watch the latest video from the New England Regional Council of Carpenters and meet some of the interesting women who are union carpenters. They're succeeding in a career they love and creating a path for others to follow. We invite you to meet these women and share their stories. Maybe someone you didn't imagine shares their dream and could move into the high-skill, high-pay career as a union carpenter. For more info about the Sisters in the Brotherhood click here. Misclassification stories developed by national news service with the help of the UBC is showing results in North Carolina. Honest contractors are speaking out and state leaders are vowing to act. Read more here. Pile Drivers Local 56 had over 35 volunteers turn out on Saturday for the annual River Clean-Up Day with the Neponset River Watershed Association. Early in the day, Massachusetts Attorney General Candidate Warren Tolman, along with former Boston City Councilor Rob Consalvo, and City Councilor Tim McCarthy stopped by the event for a meet and greet with the volunteers. The crew of volunteers, split into three groups, worked along a stretch of the Neponset River in Hyde Park. One group’s haul of trash included five shopping carts, four car batteries, two mostly intact 4-cylinder car engines, a cash register, tires, bumpers, and steel piping. The pile driver volunteers put their rigging skills to good use, with some crews utilizing come-alongs and chokers to pull the heavy and entrenched items out of the mud, while others rigged the loads for hoisting by crane or tow truck. One member hauled out a shopping cart, only to realize it had become home to an 18" snapping turtle. LU 56 member Mike "Turtle Man" Cummings kindly relocated the turtle about 50 yards downstream. A picnic lunch was held after the cleanup for the enthusiastic group of volunteers. Volunteers from Local 107 built a 75-foot long replica canal as part of the Blackstone Canalfest held this past weekend. The Canalfest is a street festival with music, entertainment, vendors, food, kids' activities. The Blackstone Canal connected the City of Worcester to Providence and the sea in the first part of the 19th century. It was covered over in the 1890s, but its waters still flow underneath Harding Street. The area is now a mixed-use neighborhood and visitor destination referred to as the Canal District. By voting No on Question 3 you show your support for the licensing of up to three resort-style casinos in Massachusetts, creating an estimated 10,000 permanent jobs and 6,500 construction jobs. Visit protectmassjobs.com to learn more. Question 3: Expanding Prohibitions on Gaming in Massachusetts. This proposed law would (1) prohibit the Massachusetts Gaming Commission from issuing any license for a casino or other gaming establishment with table games and slot machines, or any license for a gaming establishment with slot machines; (2) prohibit any such casino or slots gaming under any such licenses that the Commission might have issued before the proposed law took effect; and (3) prohibit wagering on the simulcasting of live greyhound races. The proposed law would change the definition of “illegal gaming” under Massachusetts law to include wagering on the simulcasting of live greyhound races, as well as table games and slot machines at Commission-licensed casinos, and slot machines at other Commission-licensed gaming establishments. This would make those types of gaming subject to existing state laws providing criminal penalties for, or otherwise regulating or prohibiting, activities involving illegal gaming. A NO vote would allow the law, which will facilitate the licensing of up to three resort-style casinos, to stand. As we celebrate Labor Day in 2014, the New England Regional Council of Carpenters continues to tell the stories of workers in our region. This remarkable video project features Julio Beldi, a carpenter who is now realizing the benefits of working as a union member after struggling as part of the underground economy, as well as commentary by Harvard's Elaine Bernard and former MA Secretary of Labor and Workforce Development Joanne Goldstein. Julio's experience is not unique. It is all too common and needs to be shared. Julio’s story underscores the continued importance of organized labor for all workers in America. Unions are the single best solution to the problems of economic inequality and injustice. So while we celebrate the holiday and the victories won by our predecessors, let us also dedicate ourselves to continuing that progress for all of America's working families. We invite you to watch this video and to share it with anyone you think may be interested. Joan Bennett, active member of Carpenters Local Union 33 in Boston, shares a day in her life as she volunteers her carpentry skills for a Rebuilding Together Boston project in Dorchester earlier this year. The video was shot as part of the One Day in Boston initiative, which this year sought to get peoples' thoughts on the future of their cities. Accelerated deadline? Union, contractor beat it! Congratulations to MIG Corporation and the UBC members working on the Morton Street Bridge in the Mattapan section of Boston. They took an "Accelerated Bridge Construction" project that was scheduled to take 10 days and got it done in 9! Union carpenters + union contractors = efficiency + convenience + value for the state, taxpayers AND drivers. Great job! Check out this page, and the second story linked on the page, for more information. The Labor Guild's School of Labor Management Relations has released its schedule of classes for the fall semester. Classes begin September 15th and run through November 10th. All classes are held in one of two periods between 7:00 - 9:30 PM. Classes will return to SEIU 1199's Dorchester facility for the Fall 2014 term. Local 1199 is located in the Corcoran-Jennison Building, 150 Mount Vernon Street, Dorchester, at the Bayside Expo Business Center. A full class list is available at laborguild.com. The mission of the Labor Guild is to provide engaging, high-quality, affordably-priced Labor-Management education. Each term, 8-10 courses are offered in a variety of topic areas including: labor law, negotiations, union goverance, leadership, public speaking,and economics. For more information, visit laborguild.com or call 781-340-7887. 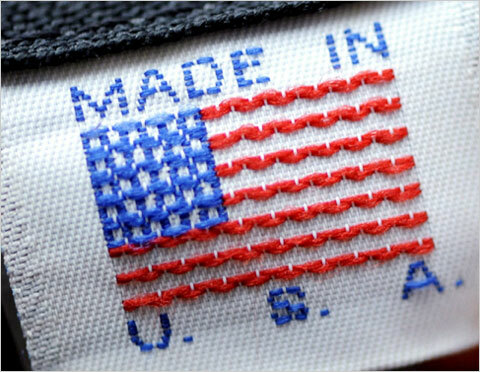 Public Citizen Illustrates Negative Effects of TPP's Threat to "Buy American"
Billions of dollars belonging to U.S. citizens could be shipped overseas if the Trans-Pacific Partnership’s threat to the “Buy American” program is enacted. Learn more on the UBC site here. Senate Republicans' Latest Attack on Davis-Bacon: A Sign of the Future? 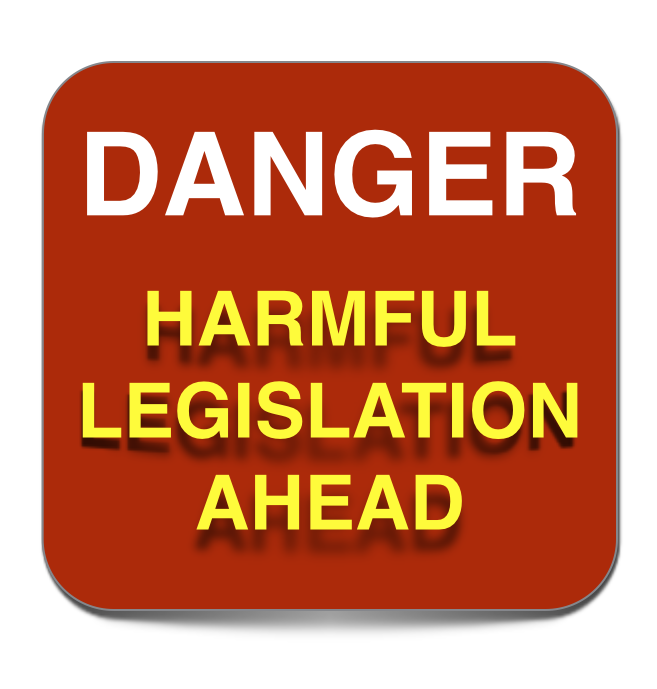 Republican Senator Mike Lee from Utah has filed Senate Bill S2617 which, if passed, would pave the way to repeal the Davis-Bacon Act. That would put millions of carpenters at risk of being paid less than the prevailing wage. Visit the UBC's website here to learn where your government representatives stand on Davis-Bacon, and vote for those who support the basic right of earning a fair wage. In early 2009, an electrical fire damaged a Worcester building that served as a home to the Stone Soup Community Resource group, a collection of volunteer organizations. With plenty of community support, but scarce funding, the group faced an uncertain future. Local 107's Dave Minasian was an active member of Stone Soup and was able to organize help from friends in the union and the New England Carpenters Training Center to join an effort to make the space usable again. YouthBuild Boston served as the general contractor on the project. YouthBuild helps low-income young adults between the ages of 16-24 work towards their GEDs, while learning job skills through training and pre-apprenticeship programs. In need of skilled labor to partner with, Local 107 member volunteers and apprentices working under the direction of NECTC instructors stepped up and became an integral part of the rebuild process. The green rebuild included fire repairs, energy retrofit weatherization work, electrical and heating system updates, and wheelchair accessibility improvements. **As of 8/28/14 this seminar has reached capacity and registration is now closed. Please check back for information about the next seminar, to be held around November. 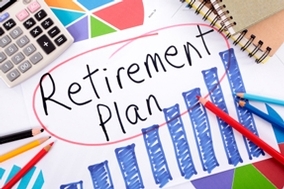 The New England Regional Council of Carpenters and the New England Carpenters Benefits Funds are hosting a complimentary seminar “Planning for Retirement” on September 6, 2014. The seminar will be held at the The Executive Court Banquet Facility located at 1199 South Mammoth Road in Manchester, NH (click here for directions) from 8:30-12:00 pm. There could not have been a more fitting site for a more important issue. Last week, Congressman Jim Himes was joined by state elected officials, labor leaders and business leaders at the Yankee Doodle Bridge in Norwalk, calling for a long-term solution to crumbling infrastructure. The Yankee Doodle, which carries traffic on Interstate 95 over the Norwalk River, is the most structurally deficient bridge in the state. It was originally built in 1958 and awaits $15 million in repairs, slated to start in 2017. It is one of thousands of road and bridge projects whose maintenance or replacement have been put off to the point of posing an extreme danger to the public. The National Highway Trust Fund received approval for a $10.8 billion infusion from the United States House of Representatives last week, but has not been acted on by the Senate. The allocation would only temporarily prevent the fund from becoming insolvent next month. It would not solve the problem of creating a long-term solution for funding road and bridge repairs in the United States, which are vital not only to public safety, but economic growth. Road and bridge repair and construction leads to direct employment of tens of thousands of construction workers nation-wide, many of whom would face unemployment if the Highway Trust Fund runs out of money. Members of the UBC as well as other building trades unions, employers and supporters are being urged to visit Hard Hats for Highways (http://hardhatsforhighways.org/) and send an e-hardhat letter to congress to urge them to enact a long-term plan. Coverage of the event at the Yankee Doodle Bridge can be found at the Stamford Advocate, the Norwalk Hour and It's Relevant. The New England Regional Council of Carpenters and the New England Carpenters Training Fund teamed up with Boston Cares, the region’s largest volunteer mobilizer, to help them with their campaign to build 500 beds for children in need in 2014. Instructors from the NECTF helped complete the design for the toddler beds so that they can be easily assembled by volunteers with minimal training. In advance of each volunteer day, member apprentices mill the lumber and prep all of the stock. Corporate and individual volunteers then assemble the beds at various locations, including the Carpenters Center and New England Carpenters Training Center. According to the Mass. Coalition for the Homeless, more than 1,500 Greater Boston school children do not have a bed, which affects their self-esteem, ability to learn, and likelihood of graduating from high school. Boston Cares works with social workers at several non-profit partners to find homes for each bed. Volunteers assemble beds at the New England Carpenter Training Center. Carpenters in Local 1302 at Electric Boat in Groton, Connecticut have successfully beat back an effort by the Metal Trades Council (AFL-CIO) to eliminate their rights and fold them into other unions. This is the first situation in the country where carpenters have stood up, fought back and defeated this piece of the national AFL-CIO's campaign against the UBC. In 2011, the national AFL-CIO's Metal Trades Department issued a directive to Metal Trades Councils across the country to remove UBC-affiliated locals from their council and prohibit them from continuing to represent the interests of their carpenter members. In February this year, the Metal Trades Council barred Local 1302 from participating in contract negotiations with Electric Boat. The new collective bargaining agreement reached in April removed any reference to the Carpenters union. Shortly thereafter, the MTC stripped Local 1302 of its ability to represent carpenters in the adjustment of their grievances and began a campaign to have carpenters join local unions affiliated with the Laborers, Boilermakers and Painters. "We tried to get a solidarity agreement with the Metal Trades Council, but it got shot down by their national people," said Bob Tardif, Chief Steward of Local 1302. "Once they shut us out of negotiations, we started to look at our options and talk to the New England Regional Council of Carpenters. We wanted to keep our identity and Mark (Erlich) said that whatever resources we needed, we would have." As a result of a petition filed by NERCC and Local 1302, a Regional Director of the National Labor Relations Board has issued a decision allowing carpenters at Electric Boat to have a "severance election." The election gives carpenters the right to choose the Carpenters union to bargain with the shipyard, separate from the Metal Trades Council, which represents all other trades workers. Voting for the Carpenters union will allow Local 1302 carpenters to continue their 70-year history of membership and representation by the Carpenters union, rather than be dispersed to other unions. The election is scheduled for later this month, though the Metal Trades Council and Electric Boat may appeal the decision to the full National Labor Relations Board in Washington, D.C.
"If the vote isn't unanimous, it will probably be really close to unanimous," said Tardif. "Right now, we're all really proud to be members of the Council and get the support we've really needed, from the Executive Board, the Delegates and everyone else. Congratulations to the courageous union carpenters of Local 1302 for standing together and winning this important fight . In an election held last night in Southeastern Massachusetts by the National Labor Relations Board (NLRB), carpenters employed by Bay State Drywall voted for union representation from the Carpenters union by a 10-8 margin. The Freetown-based company is one of a group of contractors in the Fall River-New Bedford area, sometimes referred to as "drywall alley," that draw carpenters from the substantial Portuguese population. During peak season, they typically employ 40-50 carpenters and have been one of the larger nonunion companies in the market. 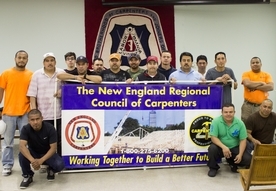 Representatives from the New England Regional Council of Carpenters have become familiar faces to Bay State employees over the years thanks to countless jobsite visits, which created a level of trust. When there were disputes with the owners over restoring pay cuts made during slow times, the workers decided to go forward with a union election. Negotiation of an agreement with Bay State cannot start until after the NLRB resolves a union challenge to the uncounted ballots of six employees that Bay State had argued should be included in the election. Those employees are primarily tapers and the Council has taken the position that they do not fall under the definition of a carpenter bargaining unit. A Board ruling on the matter may take as long as two months. "I'm proud of the carpenters who had the courage to stand up to the company and proud of our staff that led the organizing drive," said Mark Erlich, NERCC Executive Secretary-Treasurer. "NLRB elections are not that common in the construction industry and this victory sends a message that we will use every tool at our disposal to represent working carpenters in New England." CTA Construction signed a collective bargaining agreement with the New England Regional Council of Carpenters on July 2nd. The contract represents a culmination of a long campaign by the Council and extensive discussions over the past few years between the two organizations. CTA was founded in 2000 by Lyle Coghlin and Pat Tompkins. Over the past fourteen years, the company has emerged as one of the larger public construction contractors in Massachusetts, with an annual volume of $138 million in 2013. CTA was listed as the 12th largest general contractor in the 2012 Boston Business Journal's Book of Lists and is currently ranked as the 376th biggest firm in ENR's national survey. "We are pleased that CTA is now a union contractor," commented Mark Erlich, NERCC's Executive Secretary-Treasurer. "We believe that access to a higher caliber of subcontractors and skilled carpenters will allow the company to grow even further." Summer brings beautiful blossoming flowers and trees but it also brings pollen and dreaded seasonal allergies. Allergies are caused by our immune system mistaking an otherwise harmless substance as an invader and triggering the production of antibodies. This response causes symptoms in our nose, throat, lungs, sinuses and eyes that can be hard to differentiate from a common cold. The first step when you have symptoms is to speak with your doctor and determine if you have a cold or allergy. • Minimizing exposure is important. 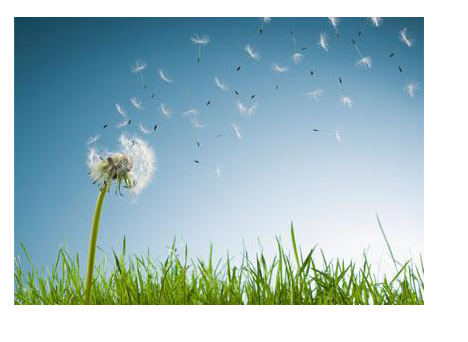 Stay indoors on dry, windy days or days when the pollen count is high. The best time to venture outside is after a good rain when the pollen has been washed out of the air. • Make sure to remove and wash clothes that have been worn outside and take a shower to clean pollen off of your skin and hair. • Keep pollen out of your home by keeping doors and windows closed especially when pollen counts are high. There are a number of websites that display pollen counts including weather.com. • Speak with your doctor about taking medication to manage your allergy symptoms, there are many over the counter options and your doctor can help determine what might be the most helpful for you. Seasonal allergies can be unpleasant but with the right combination of avoidance and possible medication your allergy symptoms can be minimized or kept under control. Please feel free to call the Carpenters Care team at 781-222-0930 if you are struggling with a cold or allergy. The efforts of the New England Regional Council of Carpenters, as part of the Policy Group on Tradeswomen’s Issues to increase women’s participation in the construction trades, are being recognized nationally at the White House Summit on Working Families today. NERCC Business Representative Liz Skidmore is representing the NERCC and the PGTI at the event, which is available for viewing online TODAY starting at 9:00 a.m.
Today, the White House, the Department of Labor and the Center for American Progress will host a Summit on Working Families to set an agenda for a 21st century workplace that works for all Americans, with a special focus on women and their families. 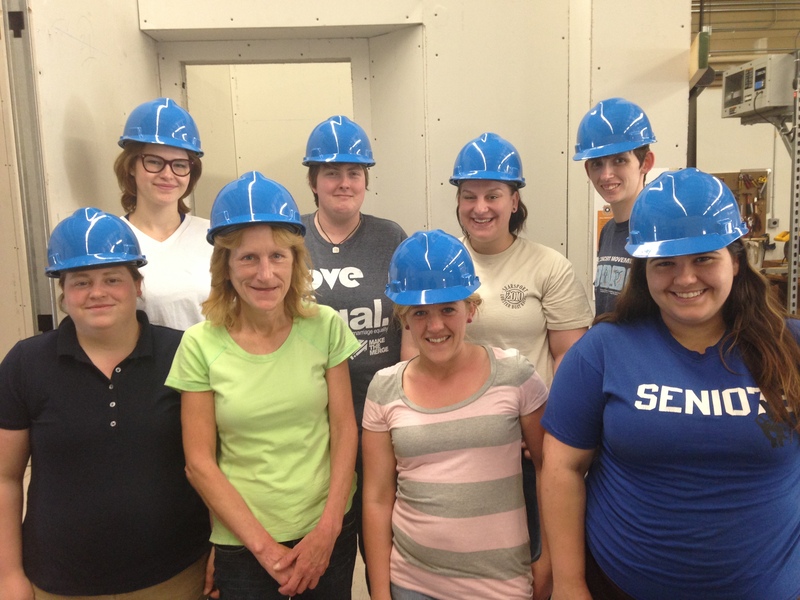 Eight women recently completed the five-week pre-apprenticeship Building Pathways New Hampshire training program. Building Pathways New Hampshire is a cooperative effort of the Carpenters Union, the State Building and Construction Trades Council and the New Hampshire AFL-CIO. It provides pre-apprenticeship training to unemployed and underemployed women in hopes of building the female ranks in the construction industry. “We are working to diversify our trade and provide a pipeline to all interested and qualified people, which means we end up with the best possible workers, not just some of the best possible workers,” notes Carpenters Local 118 Business Manager Liz Skidmore, who has been active in both local and national "Sisters in the Brotherhood" programs and is helping to coordinate the Building Pathways NH program. Carpenters Local 118 Business Manager Liz Skidmore speaks to the graduates. The five-week course was held at the Carpenters Training Center in Manchester and began on May 12th. The pre-apprenticeship training including OSHA 10, First Aid/CPR, construction math, materials handling, blueprint reading, labor history, blue collar financial planning. The program aims to introduce participants to the variety of work opportunities available, in a hands-on environment. This training was offered by various trades’ training programs including: Carpenters Local 118, Floorlayers Local 2168, Piledrivers Local 56, Boliermakers Local 29, Heat and Frost Insulators & Allied Trades Local 6, IBEW Local 290, Ironworkers Local 7, Laborers Local 668, Painters and Allied Trades DC 35, Plumbers and Pipefitters Local 131, and Sprinklerfitters Local 669. Building Pathways graduates look at their completion certificates. All eight graduates have applied to various trades Apprenticeship Programs. Two have already been accepted into the Plumbers and Pipefighters Local 131 Apprenticeship Program. For more information about the Building Pathways New Hampshire program click here. The efforts of the New England Regional Council of Carpenters, as part of the Policy Group on Tradeswomen’s Issues to increase women’s participation in the construction trades, are being recognized nationally at the White House Summit on Working Families this Monday. NERCC Business Representative Liz Skidmore will represent the NERCC and the PGTI at the event, which is being hosted by the White House and the Department of Labor and the Center for American Progress. Both President Obama and Vice President Biden will be attending the event. The White House planning committee for the Summit asked the National Task Force on Tradeswomen's Issues for two "Best Practices" for getting more women into the trades. The Task Force presented them with the Minnesota Vikings stadium project, which set hiring goals and has hired a lot of women, and the work being done in New England by NERCC and the Policy Group on Tradeswomen's Issues (PGTI), which is convened by Skidmore, Susan Moir of UMass Boston Labor Resource Center, Brian Doherty of the Boston Building Trades and Janet Jones of the Dorchester Roxbury Labor Committee. The PGTI has established a multi-stakeholder strategy of bringing key players together over time to build relationships, share expertise, identify and implement solutions. The group has met at the Carpenters Center every other month for six years and includes city, state and federal officials; General and sub-contractors, academics, compliance officers, tradeswomen, and union leaders. During this time they have published two reports: Unfinished Business, an analysis of all research done on tradeswomen in the last 25 years in the US with policy recommendations and Finishing the Job, a how-to manual for meeting hiring goals on specific construction projects. Women's employment has risen from 3% to 6% of all hours worked in Boston over the last few years, a statistic made even more significant when considering the simultaneous increase in the number or work hours over the past two years. Additional work being done by PGTI that has earned them recognition as a national best practice includes moving from 35 years of supply-only (recruitment and pre-apprenticeship training) to a supply and demand strategy that includes the supply work and adds demand - working to improve compliance with hiring goals. As a result of their work, the Integrated Science Center at UMass Boston building project, which is the first project in Boston that has met hiring goals for all three established goals (residents, minorities and women) over the course of the project. PGTI has also compiled compliance numbers online in searchable, downloadable databases by a number of entities including the City of Boston, UMass Boston (for their $700 mil PLA), and the MA Bureau of Apprenticeship Standards. These databases are now being used by GCs and project owners to review past compliance history and in evaluating which contractors to hire. Learn more about the work of the PGTI by visiting their website here. To follow the events happening during the White House Summit on Working Families click here. The NERCC has developed a uniquely tailored program with Wentworth Institute of Technology's College of Professional and Continuing Education which allows members to earn college degrees at a discounted tuition rate and a schedule that fits the needs of working carpenters. On June 25th members can participate in a lunchtime webinar to learn more about the program.Click here to learn more about the program including curriculum requirements, academic schedule, and the application process. Union representatives recently go together with more than 15 carpenters who were employed by J&V Construction to collect checks for back wages. Each of the men was issued a check for between $20,000-24,000. The union had spoken to the men when they were working at UConn, building the new basketball training center earlier this year. After learning they were owed significant money from their employer, they encouraged and helped them file wage claims with the state. For the individual carpenters, the checks represent a big win; significant money they had earned, but thought they'd never get. For the union and the rest of the industry, the checks are another reminder that knowing your rights and standing together to protect them is a worthwhile venture. Congratulations to these carpenters and the union representatives who helped them get justice. 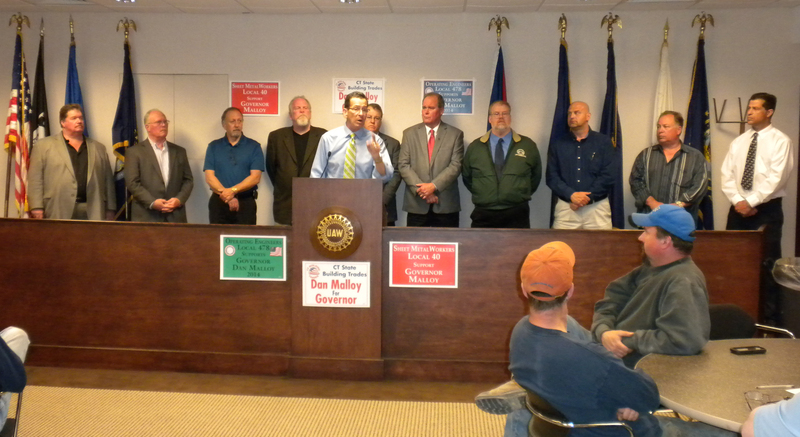 At a recent event held at the UAW in Farmington, CT, Governor Dannel Malloy spoke with rank-and-file carpenters and other tradespeople to talk about the industry and issues at the state house. The Governor spoke specifically about PLA projects and upcoming work that he has secured to get the construction industry moving in Connecticut.One project in particular involves the announcement of a "historic agreement" made with United Technologies Corporation (UTC), which plans to invest billions in research, development, facilities and capital expenditures around the state over the next five years. Plans include construction of a new headquarters for Pratt & Whitney, a unit of UTC, which will create an estimated 1,500 construction jobs. 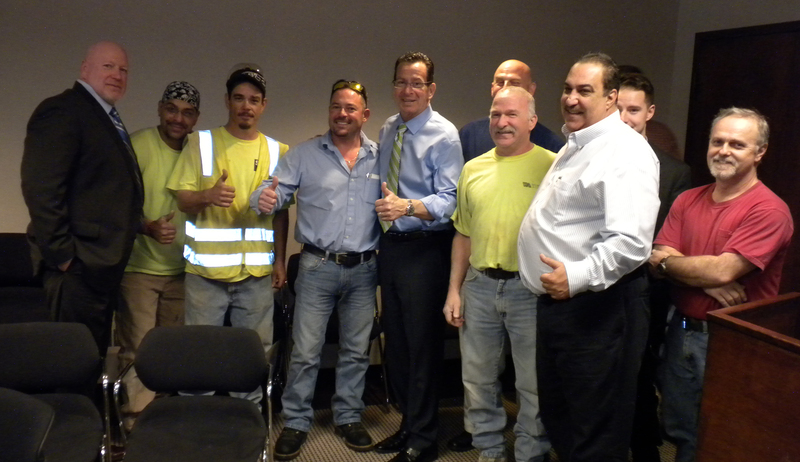 Governor Malloy has been supportive of construction projects and PLAs noting that, “project labor agreements ensure that we have the best trained workforce in place for our more important projects." The New England Regional Council of Carpenters announced that it has awarded $59,650 to 152 applicants as part of the 2014 Scholarship Contest. The NERCC Scholarship Fund is supported by settlement agreements between the union and contractors and other contributions. Its function is to help members and dependents who are attending school with the ever-increasing costs of a college education. Students must be enrolled in post-high school program and maintain a “C” average in at least three, three-credit courses to apply. All applicants must complete an essay, which is read and scored by a panel of judges who do not know the identity of the writers. Applicants were required to write an essay of between 500 and 1000 words on the following topic: Union workers at Boeing Co. in Seattle recently vote on a proposed contract that eliminated their pension plans in exchange for guarantees of future jobs. What are your thoughts on this controversy vis-à-vis the role of the company and the role of the unions? If you were a union member there, how would you have voted and why? A $5,000 first prize was given to Kaitlyn Benoit, daughter of Floorcoverers Local 2168’s Daniel Benoit. A second prize of $3,000 was awarded to Joseph Cunningham, whose father, Peter Cunningham, is a member of Carpenters Local 33. The New England Regional Council of Carpenters particapted in the One Day on Earth project on April 26th to film stories about the future of Boston. On April 26, 2014, the NERCC and Boston Cares teamed up to work toward a goal of making 500 beds. At the Carpenters Training center in Dorchester, volunteers from both organizations came together to build 30 beds in about 2 hours. NERCC teamed up with Boston Cares earlier in the year to help with the Bed Project, see pictures from these additional volunteer efforts by clicking here. The Carpenters and Boston Cares | Bed Project from ellen webber on Vimeo. One Day on Earth started in September of 2008 with the goal of creating a unique worldwide media event where thousands of participants would simultaneously film over a 24-hour period. On April 26th, 2014 hundreds of filmmakers, non-profit organizations, and inspired citizens documented stories and investigated 10 questions for the future of Boston as part of a city-wide, participatory media-creation event. The resulting media will be showcased in an interactive geo-tagged archive and a TV series on the future of the American city. In addition, local media partners will showcase the most powerful and inspiring videos created during the one-day filmmaking event. Mark Erlich, Executive Secretary-Treasurer of the New England Regional Council of Carpenters, issued the following in response to Shirley Leung's June 4 Boston Globe column about middle class housing development in the city. "Shirley Leung’s June 4 column on the “deafening whisper campaign” that attributes the high cost of building middle class housing to overpaid union construction workers is a shallow and misguided analysis. Yes, there is a housing crisis and all hands need to be on deck to achieve the City’s goal of 20-30,000 new units. But labor makes up less than 25% of total housing production costs and is rising far more slowly than land, fees, and other soft costs. "The reality on the ground is that hundreds of non-luxury units are under construction in East Boston, Allston-Brighton, and Jamaica Plain – all with union labor. Further, our members have built most of the non-profit development community’s affordable housing in Boston’s neighborhoods. "Sadly, Leung has listened to a handful of whisperers comfortably located in up-market offices and condos who seek to eliminate the job opportunities of the very men and women who are the middle class Bostonians that the City’s housing policy is designed to accommodate." The Connecticut Department of Labor has issued six "Stop Work" orders so far this week, two on a Stamford project and three more at an Apple store in West Hartford. All six were the result of subcontractors not having legally required workers' compensation insurance coverage in place. Shane Gordon Drywall, of Stamford, Marcelo Drywall of Bridgeport and Arco Steel Company, of West Caldwell, New Jersey were each hit with the orders yesterday at 66 Summer Street in Stamford. The companies were working for Trinity Financial on Phase 2 of the Park Square West project, which includes 194 residential units. Some workers on the project recently reported to union representatives that they were employed by Intext, a company that was already caught for misclassifying workers as independent contractors in April at UConn. In West Hartford, three subcontractors identified in press reports only as being from out of state were issued stop work orders while working for California-based general contractor Dickinson Cameron. Gary Pechie, head of the Wage and Workplace Standards Division of the Department of Labor reported that contractors had ignored the orders and continued work. He has issued $1,000-a-day fines and scheduled a meeting with Apple officials. In the last year, fast food workers across the country have been building a campaign to raise wages in their industry. The campaign has given energy to efforts to raise the minimum wage nationally and in states and communities across America. But the fast food industry isn't the only one where massive profits are generated and an unreasonable gulf exists between the compensation given to employees in corporate offices and those on the front lines. From health care to hospitality and construction to customer service, too many workers are being paid too little for working so hard. In Massachusetts, an upcoming event aims to elevate their cause. The New England Regional Council of Carpenters is joining individuals in Boston and Springfield on June 12 to support low wage workers. Hosted by Massachusetts Jobs with Justice, the Low Wage Worker Day of Action will bring information and focus attention on people who work hard and still struggle to support themselves and their families. More than that, it will encourage workers to begin standing together and acting together in a way that will make a difference. The event matches the efforts of the Carpenters union who monitor nonunion construction sites and build relationships with nonunion carpenters. All too often, nonunion carpenters are not provided the wages and benefits they deserve, given the level of skill required and risk present on today's construction sites. In Boston, the event will be held at Copley Square, in Springfield it will be at the Mount Calvary Church at John Street and Plainfield Street (Rt 20A). Both events will take place from 4-6 pm. Union carpenters, friends and families are invited and encouraged to participate. Congratulations to Local 1305 Representative Dan Rego for being honored with the Portuguese Heritage Award! 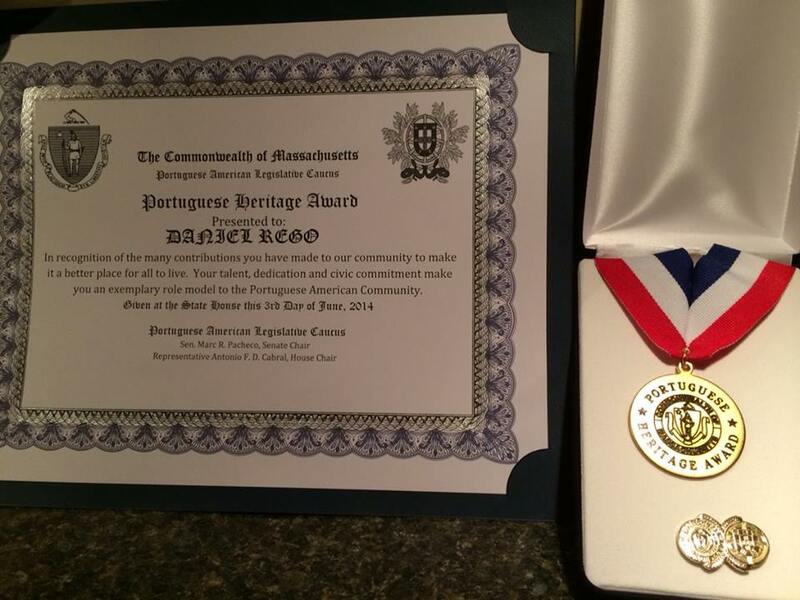 Rego was given the award at a ceremony at the State House in Boston by the Portuguese American Legislative Caucus. In addition to being a full-time Council Representative and active member of the community, Dan is a City Councilor in Fall River, where he lives with his family. The Connecticut Labor Department has issued “Stop Work” orders against three construction companies at a shopping center construction site at 230 Industrial Park in Old Saybrook, for failing to provide the required state workers’ compensation coverage or unemployment coverage for their employees. Two contractors, Alvin Quality Masonry LLC and Industrial Technical Services Inc. were issued “Stop Work” orders after inspectors from the Wage and Workplace Standards Division determined that the contractors, working on the Big Y supermarket project, did not have workers’ compensation or unemployment insurance coverage for employees. G&F Group LLC was issued a stop work order on the Kohl’s building project for failure to have workers’ compensation or unemployment insurance coverage and for misclassifying its employees as independent contractors. “Stop Work” orders result in the halting of all activity at a cited company’s worksite, as well as a $300 civil penalty for each day the company does not carry workers’ compensation coverage as required by law. The New Haven Register, The Day, The Bristol Press, Insurance News Net and Shoreline Times reported on the story. To view a PDF of these articles, click here. The New England Regional Council of Carpenters today endorsed Martha Coakley for Governor of Massachusetts, citing her experience making government work on behalf of fairness for workers and honest business. "As Attorney General, Martha Coakley has been an advocate for working families and consumers," said Mark Erlich, Executive Secretary-Treasurer of the NERCC. "Her Fair Labor Division sought to limit the impact of the underground economy - protecting workers and leveling the playing field for employers that play by the rules. As a candidate for Governor, she recognizes that growing income inequality is one of the major problems facing our society. Coakley knows that advocating for workers and supporting unions is the best method to rebuild the middle class. The New England Regional Council of Carpenters is pleased to endorse Martha Coakley for Governor. We believe she will bring the lessons she has learned as Attorney General to the corner office and make Massachusetts a stronger and more equitable Commonwealth." Coakley was proud to have the support of the Carpenters union, which boasts a strong reputation for campaign and political activism among its members. “Together, we can create a fair economy on our terms, by leveling the playing field, protecting our workers and creating good jobs at fair wages with quality, affordable health care," Coakley said. "I am honored by NERCC's support and look forward to working with them to make Massachusetts prosperous and fair." 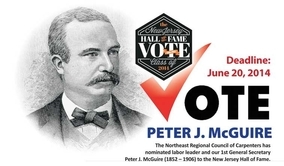 NERCC is the regional governing body of the United Brotherhood of Carpenters, one of North America’s largest building-trades unions, with nearly a half-million members in the construction and wood-products industries. NERCC advocates for all working carpenters, unionized or not, because they believe that all workers deserve fair wages, benefits, and safe working conditions. 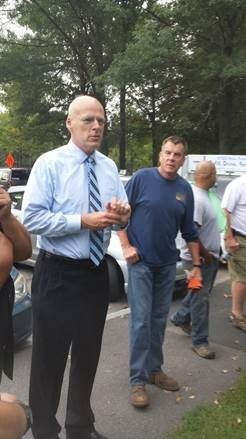 BOSTON -- The New England Regional Council of Carpenters will announce their endorsement of Warren Tolman for Attorney General at a gathering today at the NERCC Headquarters in Dorchester. The NERCC represents over 20,000 carpenters, pile drivers, shop & millmen, and floorcoverers working in the New England states of Connecticut, Maine, Massachusetts, New Hampshire, Rhode Island and Vermont, endorsed Tolman because of his vow to create a progressive, proactive Attorney General's Office that prioritizes protecting Massachusetts families. "I'm honored to have the support of the hard-working men and women of the New England Regional Council of Carpenters," Tolman said. "Keeping the middle class intact and growing our economy means leveling the playing field for working families. As Attorney General, I will never waver in my commitment to standing with our workers." "The position of Attorney General is critical for those of us in the construction industry since that office is charged with addressing the problems of wage theft, the underground economy, and the creation of a level playing field for all participants," said Mark Erlich, Executive Secretary-Treasurer of the New England Carpenters Union. "We are confident that Warren Tolman will make an exceptional Attorney General. He brings thoughtfulness, a wealth of experience, and a zeal for public service to his candidacy. The New England Regional Council of Carpenters is pleased to endorse Warren and will work hard to support his campaign." Earlier this month, Tolman announced the support of the Massachusetts Teachers Association and the State Council of the Service Employees International Union. Tolman has the support of all four former Attorneys General, Frank Bellotti, Scott Harshbarger, Jim Shannon, and Tom Reilly. Tolman has also announced the support of Senate President Therese Murray, former State Treasurer and Democratic Gubernatorial Nominee, Shannon O’Brien, his campaign leadership team of State Senator Linda Dorcena Forry and Salem Mayor Kim Driscoll, and the backing of former Massachusetts Democratic Party Chair John Walsh. Members from Carpenters Local 94 recently volunteered to help students from the Rhode Island School of Design (RISD) and Brown University prepare for the 2014 Solar Decathlon Europe. The international competition, showcasing the latest in energy-efficient design and construction, will take place this year in Versailles, France.Members helped the team of students construct their entry, named Techstyle Haus, a one-of-a-kind passive home design with an enclosure made entirely of textiles. The international Solar Decathlon competition challenges students to build energy-efficient and innovative solar-powered homes. Students from the two schools teamed up with a group from the University of Applied Scinces Erfut in Germany to design the 800-square foot house, which is made of a Teflon-coated woven fiberglass, commonly used in sports domes. NERCC signatory contractor Shawmut Design and Construction is a sponsor of the project. Hats off to the team of volunteers from Local 94: Ted Lafond, Frank Taraborelli, Kevin Hart, Ryan Del Toro, Gary Roy and Carl Noelte. On May 1st, the New England Carpenters Training Center hosted a graduation ceremony for the 2013 New England Carpenters Training Fund Apprentice Graduates. 129 members, representing 20 locals, completed their training in the apprenticeship program in 2013. 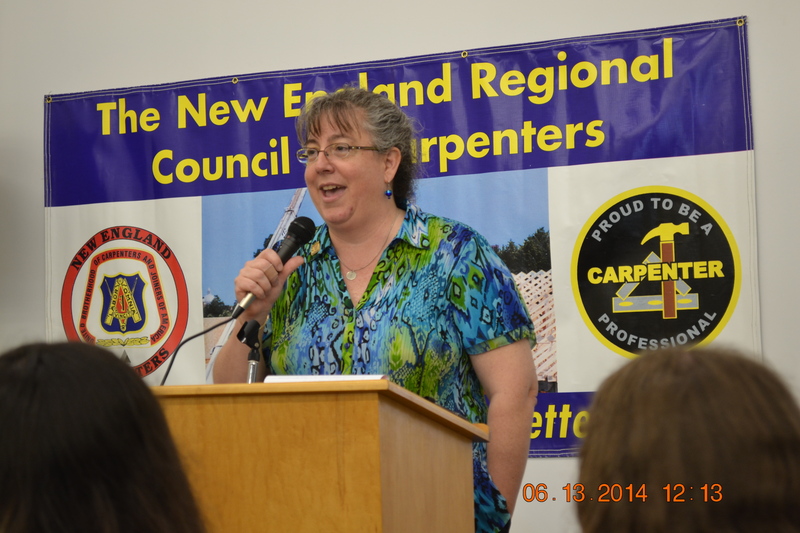 Mark Erlich, Executive Secretary-Treasurer of the New England Regional Council of Carpenters was the Keynote speaker. 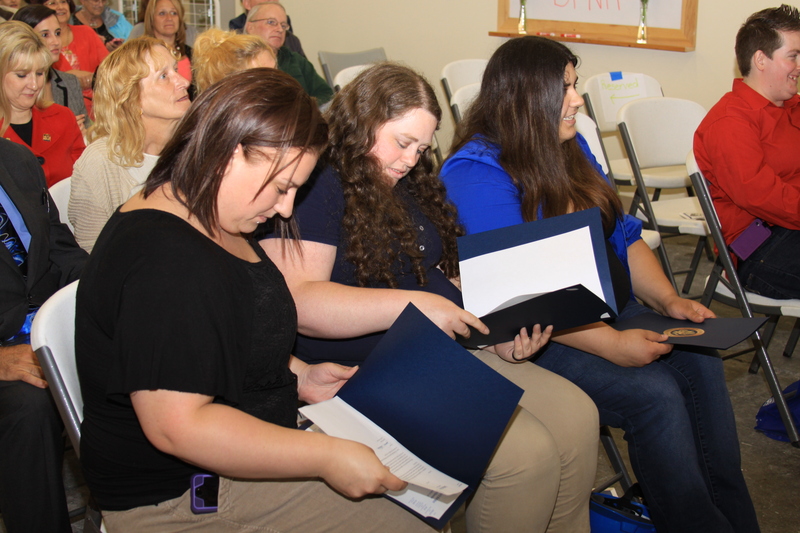 Four members were specially recognized with awards given out at the ceremony. Local 107 member Corey Wagner, Local 94 member Alex Palmisciano and Local 56 member Thomas Stone each received the Golden Hammer Award. This award is given out each year to one member from each of the trades represented in that year’s graduating class. It is awarded to the graduate demonstrating outstanding craftsmanship and dedication to the profession. Local 33 member Emerson Ocampo received the Zachary Constant Award, recognizing the graduating apprentice who displays an all-around commitment to the craft, the union and the community. 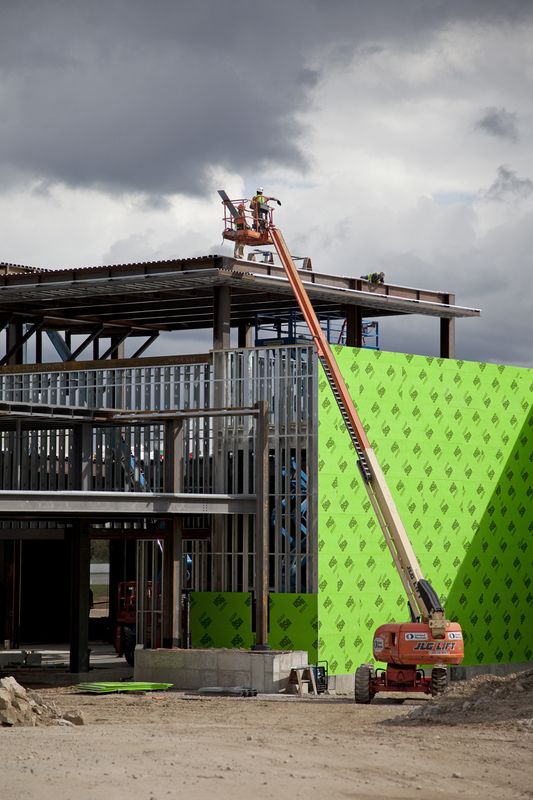 All members are encouraged to continue their education and continuously enhance their skills as it will increase employment, safety on the job site, and productivity in such a competitive market. Learn more about this uniquely tailored program here. The Carpenters union is calling on local and state officials to rescind tax breaks given to a company for a project on which they and seven others had already been ordered by state investigators to stop work for legal violations. The violations were found less than three months before the tax package was announced. Further evidence gathered by investigators, which should have triggered an investigation for tax fraud, was apparently ignored. In December, Great Wolf Lodge and others were ordered to stop work on their Fitchburg project by the Department of Industrial Accidents after a site visit revealed they did not have workers' compensation policies in place for construction workers. One of the employers told investigators at the time that “he had four employees on site who are being paid in cash, they receive their direction and control from Mr. Viveiros, all tools and equipment belong to him.” Two weeks later, an Organizer for the New England Regional Council of Carpenters visited the site and found the same employment conditions for other contractors on site. In March, the state announced approval of a group of tax break packages, including $17.2 million for the Great Wolf Lodge. Mark Erlich, Executive Secretary-Treasurer of the New England Regional Council of Carpenters sent a letter of concern to Greg Bialecki, Secretary of the Executive Office of Housing and Development, which approved the tax breaks. "The lack of oversight on a project involving $17 million in tax relief should be a matter of grave concern to the Patrick administration. The violations were committed before the tax relief was awarded. That relief should be rescinded," said Erlich in the letter. 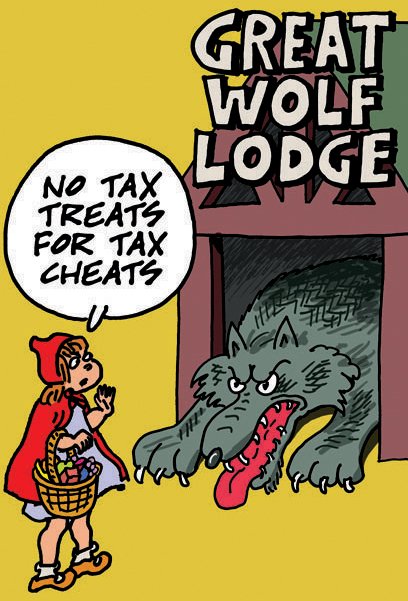 "Without any further action on Great Wolf, the Commonwealth is sending an unfortunate message to its taxpayers and legitimate contractors that recipients of tax relief are rewarded regardless of illegal business practices." "Great Wolf promised in its application that it would not knowingly hire subcontractors or other third parties that did not have Massachusetts workers' compensation insurance. Great Wolf's Senior Director of Design and Construction acknowledged the "Stop Work" order to a newspaper." Misclassification of workers as “independent contractors” is an illegal, but unfortunately common model used in the construction industry to provide unscrupulous contractors with a significant advantage in a highly competitive industry. Misclassification costs the state and federal government hundreds of millions of dollars in lost revenue and strips workers of important workplace protection, as well as the right to unemployment and retirement benefits. Lemonade Day is a national event designed to empower young entrepreneurs using a classic kid-business venture – the lemonade stand. On Lemonade Day, mentors teach basic business skills while helping kids start and run their own lemonade stands. The New England Regional Council of Carpenters played an important role in Lemonade Day Boston, which will take place on May 3rd, by hosting a Build-a-Stand workshop at the Carpenters Center. In preparation of the workshop, first-year apprentices at the Carpenters Center built lemonade stands from materials donated by NERCC signatory Gilbane, Inc. During a workshop held at the Carpenters Center, young volunteers from local elementary schools and YMCA programs worked alongside apprentices to assemble and paint the stands. Boston Mayor Martin Walsh stopped by to visit the workshop. Launched in Houston in 2007, the event has spread to 36 cities in the US and Canada. An estimated 3,300 schoolchildren will participate in Lemonade Day Boston by planning, building and running lemonade stands throughout the city. It could appear on our blog!